Each district conducts monthly workshops, called “Roundtable,” to convey current information on upcoming events and activities and to provide program specific information and ideas for unit programs. Most districts offer Roundtables for Cub Scout Leaders and Boy Scout Leaders, with Varsity and Venturing leaders welcome in the Boy Scout Leaders Roundtable. A few districts offer specific roundtables for Varsity and Venturing Leaders as well. Check with your District Commissioner or District Executive for more information on Roundtables. Please refer to your district calendar or contact your District Executive for more information. A POW WOW is a grand display of the spirit of Cub Scouting. It is a day of fun-filled events, discussions, techniques, and hands-on opportunities. The POW WOW is conducted by the Great Southwest Council, and is a must for all pack Leaders. Basic training includes a lot of ideas and theory, but POW WOW has lots of hands-on crafts, ceremonies, and demonstrations. Den Leaders, Cubmasters, Committee Members, and parents will come away with more than a year's worth of program ideas. Often the Den Chief Training is offered at POW WOW. The Great Southwest Council will be conducting one Pow Wow within the council within the Albuquerque area. Consult the Council calendar for additional information. This course orients you to the health and safety programs of the Boy Scouts of America, and may include Safe Swim Defense, Safety Afloat, Climb on Safely, and the new Trek Safely. The Trainer Development Conference is for anyone interested in different training methods. It will equip you with ideas, techniques, and materials for improving presentations by trainers, presenters, and leaders. Training is conducted in each service area or district annually. Please refer to your district calendar or contact your District Executive for more information. Wood Badge has been developed for Cub Scout, Boy Scout, Varsity Scout, and Venturing leaders, as well as council and district leaders. Its focus is on leadership skills. The primary purpose of the Wood Badge experience is to strengthen Scouting in our units, districts, and council. The Wood Badge “ticket” represents your commitment to complete a set of personal goals relating to your Scouting position. These goals will significantly strengthen the program in which you are involved. In addition, the ticket gives you an opportunity to practice and demonstrate a working knowledge of the leadership skills presented during the course. You will have 18 months to complete your ticket. Upon completion of the Wood Badge ticket, as certified by a ticket counselor and the Scout Executive, you will be presented with the Wood Badge certificate, neckerchief, woggle, and beads at an appropriate ceremony. 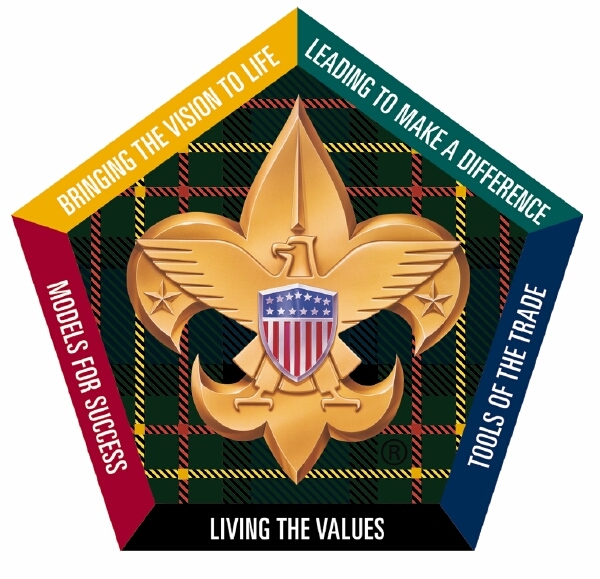 What are the Objectives of Wood Badge? And of course, since Scouting is a game with a purpose, expect to have a lot of fun! This two-hour course is designed to strengthen relationships between Scouting and our chartered partners. Chartered Organization Representatives who understand their responsibilities can be an invaluable resource to their units. The resource for training the Chartered Organization Representative can be obtained here.